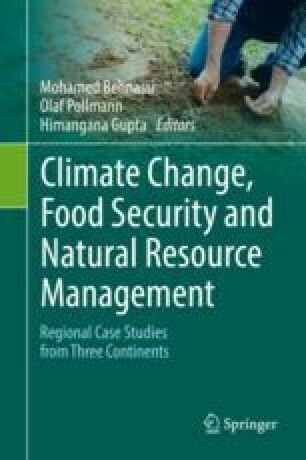 The chapter bears upon the challenges for food security in Yemen and the factors that constrain sustainable development of the agriculture sector. The serious constraints that prevent the agriculture sector to flourish include, inter alia, low productivity, lack of financial resources, inadequate marketing systems, low human resource, poor infrastructure, dearth of suitable production technologies and insufficient availability of inputs. The government has also been responsible for the poor state of agriculture because over the years due to financial crisis it has not assigned high priority to this vital sector of economic activity. External factors such as climate change, internal social conflicts, and security issues are also negatively impacting on the agricultural sector. The government has to spend a huge amount of money to import food commodities to meet its food requirements, although considerable potential exists to earn a significant amount of foreign exchange by exporting its good quality coffee. A major portion of the meager resources (land and water) of the country is being utilized to produce qat – a narcotic plant chewed by the huge segment of population. The qat is gradually replacing coffee and appears to be the chief rival of the coffee crop, restricting its growth to small pockets of land. Thus, in the present scenario, the country needs a sound plan, and a pragmatic policy that could re-establish agriculture sector to ensure food security and alleviate rural poverty. Agricultural extension can play a critical role in addressing the issues faced by the agricultural sector and help in enhancing food supplies. Unfortunately, the National Agricultural Extension Service (NAES) in the country is also beset with innumerable problems that, besides others, range from organizational weakness, lack of resources, poor extension staff performing non-extension activities with no clear responsibilities. The chapter provides in-depth analyses of the issues and challenges that render NAES ineffective and inefficient. If measures are taken in letter and spirit to improve the National Extension Service, it can help the country realize sustainable agriculture. Therefore, the purpose of the study is to identify the constraints faced by the agricultural sector and national extension system and suggest suitable innovative strategies that could improve crop yields and ensure food security through sustainable agricultural production systems. Al-Monitor. (2014). Yemen’s coffee revival. Al-Monitor: The pulse of the Middle East. Available at: http://www.al-monitor.com/pulse/culture/2014/02/yemen-revive-historic-coffee-trade.html. Assessed on 2 Apr 2015. Al-Shehri, S. (2011). Yemeni coffee crop: Historic fame, production areas and the famous types. Available at: https://ar-ar.facebook.com/notes/feecoffee//297430906966087. Accessed on 25 Dec 2014. IFAD (International Fund for Agricultural Development). (2013). Harvesting water to increase productivity. Seeds of innovation: NENA and CEN Regions. Rome. www.ifad.org/operations/projects/regions/pn/infosheet/IS4_Sudan.pdf. IRIN. (2007). Yemen: Land degradation threatening farmers, says senior official. News published on Oct 18, 2007 in IRIN International News. Available at: http://www.irinnews.org/report/74843/yemen-land-degradation-threatening-farmers-says-senior-official. New Agriculturist. (2010). Country profile – Yemen. Available at: http://www.new-ag.info/en/country/profile.php?a=1371. Assessed on 5 Apr 2015. Qamar, M. K. (2012). Extension in Yemen.Global Forum for Rural Advisory Services. Available at: http://www.g-fras.org/en/world-wide-extension-study/130-world-wide-extension-study/asia/western-asia/330-yemen.html#history. World Bank. (2011b). World development indicators database. Accessed 10 Sept 2014. http://databank.worldbank.org/.